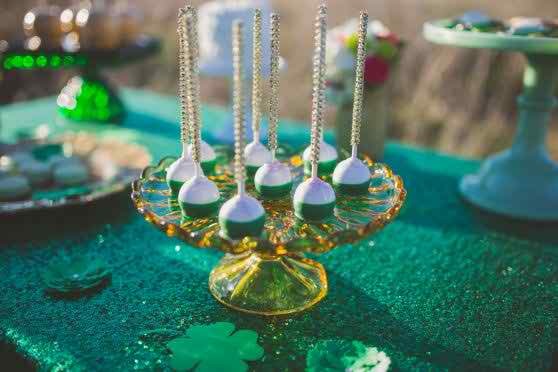 A styled engagement shoot with a St. Patrick’s Day theme? If you know me and my love for emerald green, then you'll know I just had to share this with you guys. Jeanette of Candy Crush Shop really had a great time with this fun and festive theme. And lucky for us (pun totally intended), Jessica McCoy Photography was there to capture every sweet second. From the sparkly tablecloths to the glitter macarons, this shoot has me seriously excited that St. Patrick's Day is only a few days away. Here's a fun fact for you: My husband and I's first date? Yep, it was on St. Patrick's Day! So this year will mark our 7th year together. Oh how the years fly by! And as cheesy as it sounds, I would definitely count myself as lucky in love! Seriously festive. Am I right? So tell me... What are your plans for St. Patrick's Day? Anyone have any fun plans in the works. Like I mentioned before, the hubby and I will be celebrating 7 years together. And of course I'll be wearing my green! 9 Comments " St. Patrick's Day Styled Shoot "
Love all the sparkle in this photo shoot! That Lucky in Love invitation is perfect! Soooo much glitter gorgeousness! My brain just shorted out from all the fabulousness and all I got is 'sparkly sparkly'! Lots of glitz and glam! Happy seven year anniversary! How adorable is this?! Love it! I'm normally not a fan of St. Patrick's Day, but this is adorable! Happy first date anniversary! Fun to see a St. Patrick's Day theme all glammed up like this! What a cute shoot! I love the gold and green together...definitely makes it more festive! What a festive engagement shoot! Oh no, this is gorgeous and very different. Throwing in much elegance to the holiday!